Ron grew up in Southern California during the 1950’s and early 1960’s. Since he was a young boy, Ron had a keen interest in cars, especially racecars. As a teenager, he was quite active in the Dry Lakes Racing and Bonneville Land Speed Record Racing. In 1964, Ron and partner Jerry Tucker, set a Bonneville Land Speed Record in a C/Gas Roadster using Chrysler power in a 1932 Ford roadster. Ron’s racing interests carried him through the 1970’s campaigning a Chrysler powered Gas Dragster. Ron’s love for Fuel Altereds began during the mid-60’s and the 1970’s. While living in Chicago, the racers used his home as a base of operations. The Rat Trap as you see it today was recreated in 1995 and first appeared at the California Hot Rod Reunion in 1996. Ron was crew on the car in the late 60’s and early 70’s but since it’s recreation has been both owner and driver of The Famed Altered. Ron Hope now lives in Franklin, TN with his wife of forty-five years, Dianne. Together, they have raised six children, which have given them 18 grandchildren and enjoy making their home in Franklin. 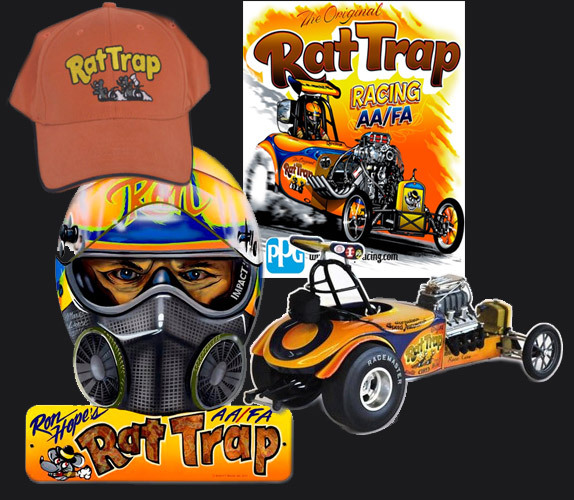 In addition to owner and full time driver of the Rat Trap AA Fuel Altered, he is also very active in Bonneville Land Speed Record events, driving a modified sports racer.